Citation Information: J Clin Invest. 2018;128(12):5505-5516. https://doi.org/10.1172/JCI98060. Conversion of myeloid cells into MDSCs by melanoma EVs. (A) HD-CD14+ cells (Mono) incubated 24 hours with melanoma EVs (Me EVs) downregulate HLA-DR (left, representative plot and summary of n = 7 HD), increase production of cytochemokines (middle), modulate HLA-DRA, IL6, and CCL2 gene transcription (right), and (B) suppress proliferation of activated CFSE-labeled T cells (percentage proliferation indicated). (C) CD14+HLA-DRneg cell frequency and HLA-DR expression on gated CD14+ cells in PBMCs of melanoma patients (Pts, n = 31) and HD (n = 15) by flow cytometry. (D) HLA-DRA downregulation of HD (n = 5) and patients’ (n = 4) monocytes cultured with melanoma EVs. (E) Induction of EV-MDSCs in CD14+ cells from a patient by autologous melanoma cell line EVs (left); suppressive activity on activated CD25+ T cells (percentages indicated, right). (F) NTA evaluation of EV size in plasma samples of patients and HD (n = 27/group) (top); correlation of EV mean size and frequency of CD14+HLA-DRneg in gated CD14+ cells of melanoma patients (bottom). 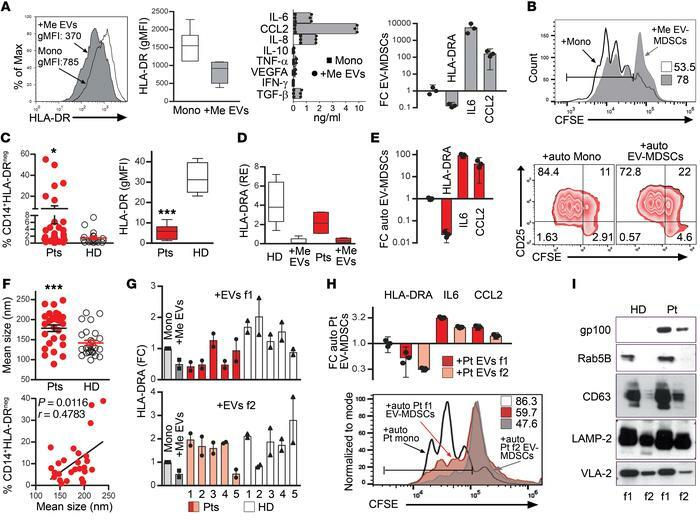 (G) EV-MDSC converting potential of f1 and f2 plasma EVs from patients and HD (n = 5/group) shown as HLA-DRA downregulation in monocytes from 2 different HD; control: melanoma EVs. Data are presented as mean ± SEM. (H) Autologous (auto) plasma EVs f1 and f2 convert melanoma patient’s CD14+ cells, as shown by modulation of HLA-DRA, IL6, and CCL2 transcripts (top). EV-MDSCs generated with autologous plasma EVs f1 and f2 of melanoma patient inhibit T cell proliferation (percentages indicated, bottom). (I) Western blot of plasma EV fractions (f1, f2) of HD and patient. gMFI, geo mean fluorescence intensity; RE, relative expression. FC was by using as calibrator untreated monocytes. P < 0.001 (A, right; E); P < 0.01 (A, left); P < 0.05 (H, top), paired Student’s t test. P < 0.05, Mann-Whitney U test (D). *P < 0.05, ***P < 0.001, unpaired Student’s t test (C, F). Data are representative of 2 (E, H, I) and 3 (A, B) experiments.